As per today, we have used 125,000,000 Kilograms of coconut shells. This is equivalent to saving 250,000,000 Kilograms of wood, which means that 250,000 trees have been saved. We can proudly say: Not a single tree was cut to make this product. Coco Nara™ just had a totally new modern and trendy look. The new thing is that each pack will have a different color. Yellow for the large packs blue for the medium and orange for the small packs. Printed in 5 colors and Spot UV, this pack is a state of art and worth to looked at. 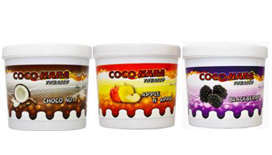 Besides Coco Nara™ we have a whole range of great products. The famous Coco Mazaya™ in 3 sizes. We also released a new finger shaped coconut shell charcoal, Coco Stix™, with short and long fingers for more choices. 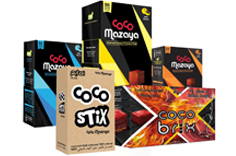 Also the hookah lounges' best choice Coco Brix™ is now available for consumers in a 2Kg pack.